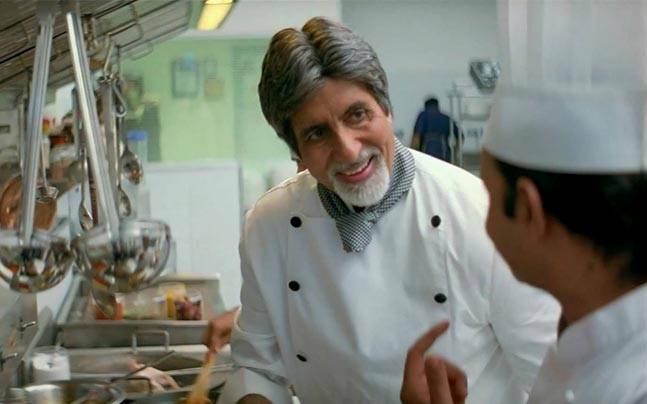 Do you like being in the kitchen and helping your parents out with cooking? Do you take charge of the kitchen on Sundays to try out a new dish for your family? 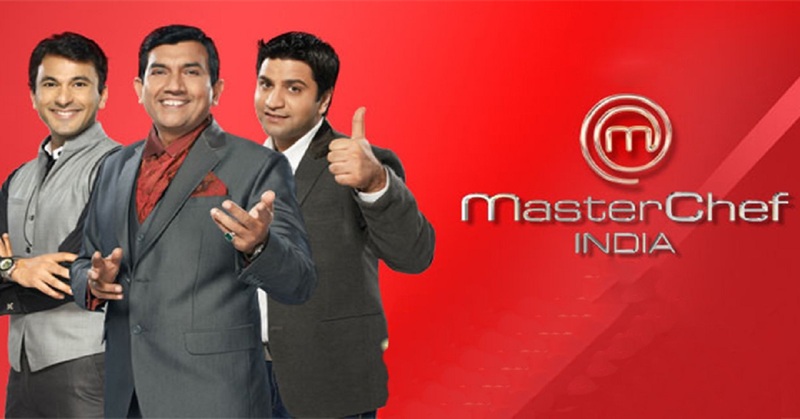 Do you often think to become a chef when you watch the Master Chef series? If the answer is yes to all those questions, you should definitely read this post on culinary careers and career as a chef. Being a chef is awesome. At present, cooking is more than just being confined to a traditional kitchen. It’s a high flying career with a lot of challenges and rewarding opportunities. But, it also takes years of hard work. Additionally, you should also possess a bucket of few essential skills and training. So, let’s have a look how to become a chef and the career path of a chef. Well, formal education is not mandatory to become a chef. After all, you can get into cooking by reading recipes online or watching videos on YouTube. But, if you want to achieve great heights in your career as a chef (a high-end chef), then a relevant degree or diploma (in addition to training or apprenticeship) will help you in several ways. You can do a diploma course in culinary arts or hotel & hospitality management after your high school to get into the culinary world. However, a formal Bachelor degree is always advantageous. What can you study to become a chef? How to make it big in the culinary field? As a starter, I will recommend a Bachelor in Hotel or Hospitality Management followed by a Diploma in Culinary Arts. 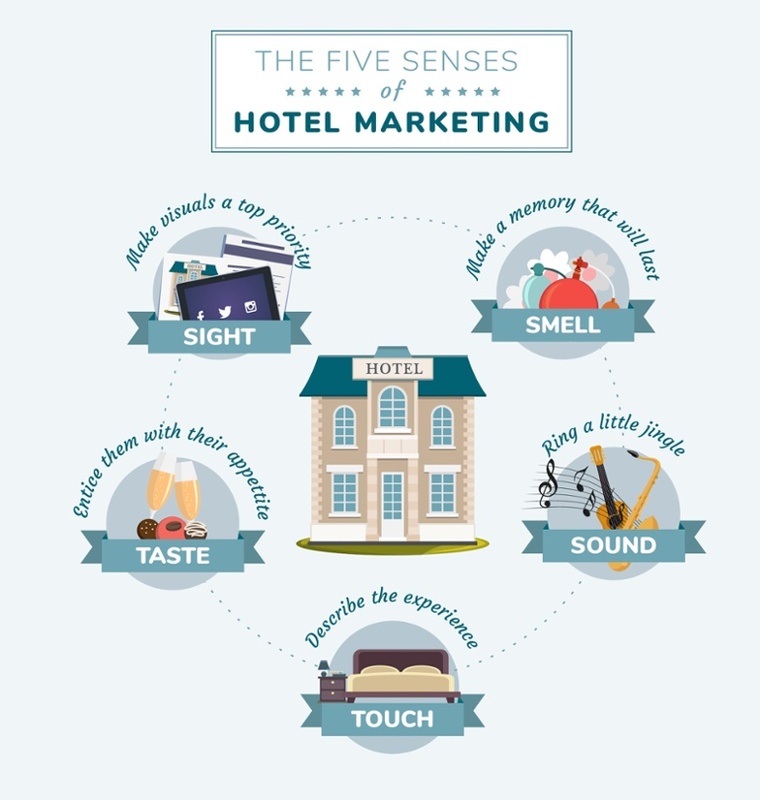 Don’t confuse hospitality management with culinary arts! A hospitality management degree will lead you to a career in Food and Beverage Service, Accommodation Operations, Travel & Tourism and Front Office. But, if you really want to become a chef, then ideally you should take up Professional Food Production courses such as culinary courses. Why should you do a bachelor in hotel or hospitality management followed by a professional culinary arts program? As I mentioned before, there is no hard and fixed path to become a chef. But, a bachelor in hotel or hospitality management followed by culinary arts program will really help you in the long-term; especially if you want to become a high-end chef or Michelin starred chefs like Sanjeev Kapoor, Gordon Ramsay or Vikas Khanna. 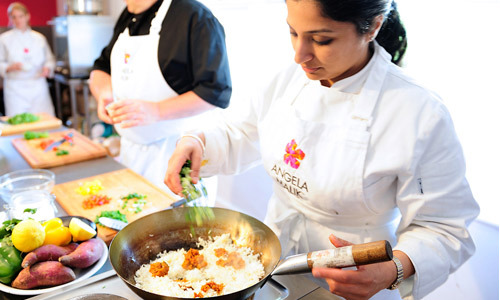 This career path will expose you to a variety of cuisines from around the world. 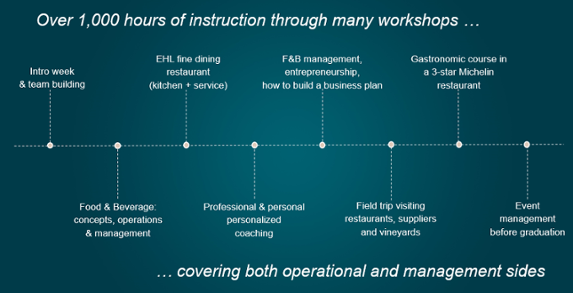 Additionally, you will learn about the business aspects of running a food or restaurant business. A hospitality management course will train you in all the four basic aspects of hospitality management. After all, people visit restaurants, cafes, bars not to just have good food. They also expect excellent customer service, a nice atmosphere, and memorable experience. Hence, it’s very critical that you learn to market your food preparations for your customers’ five senses. A professional culinary program (say a post-graduate diploma) will help you to specialize in the arts & business of professional cooking. Who is a Michelin Starred Chef? A Michelin Star is the most coveted award that any chef aspires for. It’s kind of a milestone in the career path of a chef. For a chef, gaining a Michelin star can make a career, paving the way for further investment in their restaurant and brand. In reality, there is no such thing as a Michelin-starred chef. The Michelin star is actually awarded to a restaurant. But, the credit, of course, goes to the chef in charge of the kitchen. Emphasis is given to the food. Michelin awards a maximum of three stars to the best hotels, restaurants, and food establishments. A single star means the food served at the restaurant is of excellent quality in its category. Two stars denote the food is good enough to take a detour for. Three stars mean the restaurant serves such excellent food that it deserves a special visit. Michelin (a French company) reviews every the property 18 months (as per their claims) unless they receive a specific complaint about a place, in which case they will form an emergency review strike team. Meet the world’s most decorated Michelin star chefs. 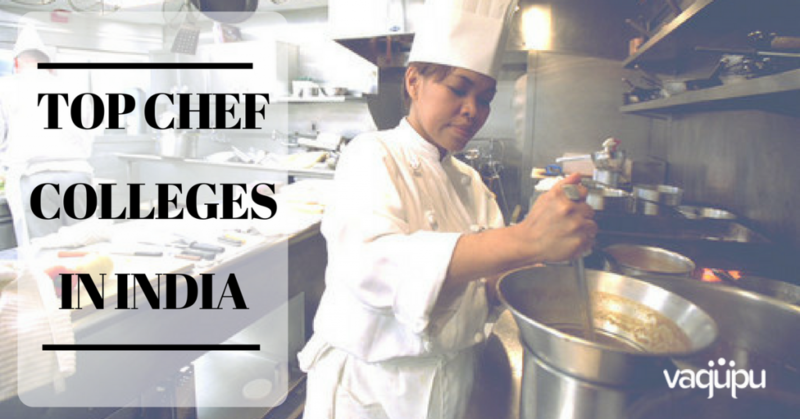 Where can you study in Culinary Arts or Hotel Management in India? If you want to study the 3-year course, you could consider the institutes registered under the National Council of Hotel Management. The private institutes generally offer 4-year degree programs. 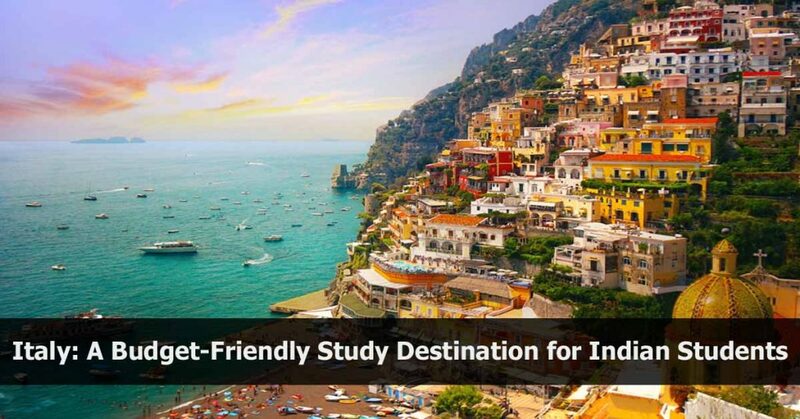 Apart from these, there are institutes run by reputed hotel chains and some private institutes with foreign affiliations and approvals from the All India Council for Technical Education (AICTE). The courses run by reputed hotel chains (e.g. The Taj Group, Oberoi, Welcomgroup etc.) are can be very helpful because of the infrastructure, the faculty they provide and the future prospects they offer. 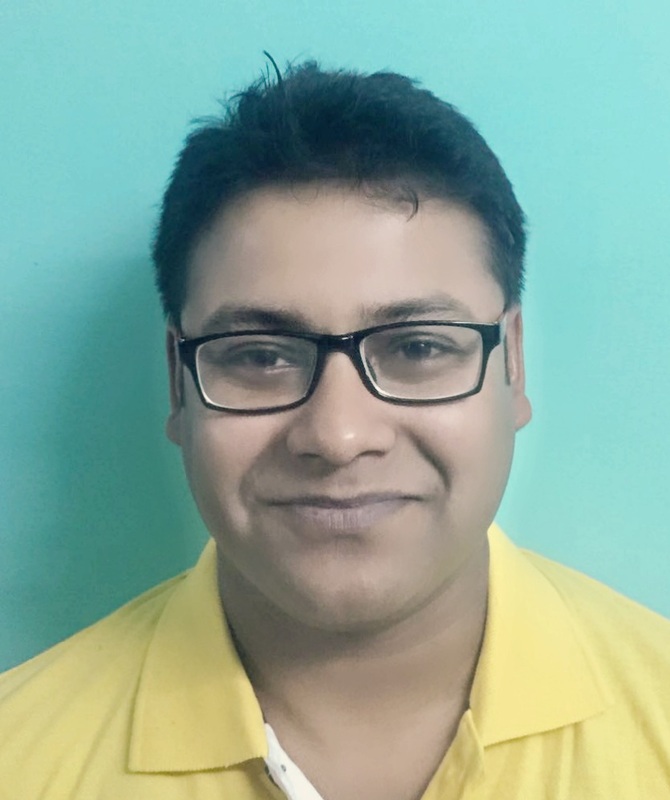 They enable the students to imbibe the exacting levels of service. Students may also be absorbed by the parent company post the training. How to choose a Culinary Program? Check out if the institute provides both academic and hands-on experience (internships and apprenticeships). Culinary Arts, much like any other area of the arts and sciences requires that you get “down and dirty” and actually try the techniques you are learning about in the classroom. A good school atmosphere is equally important. Check out the faculty members; you have to work with great chefs to become a successful chef. 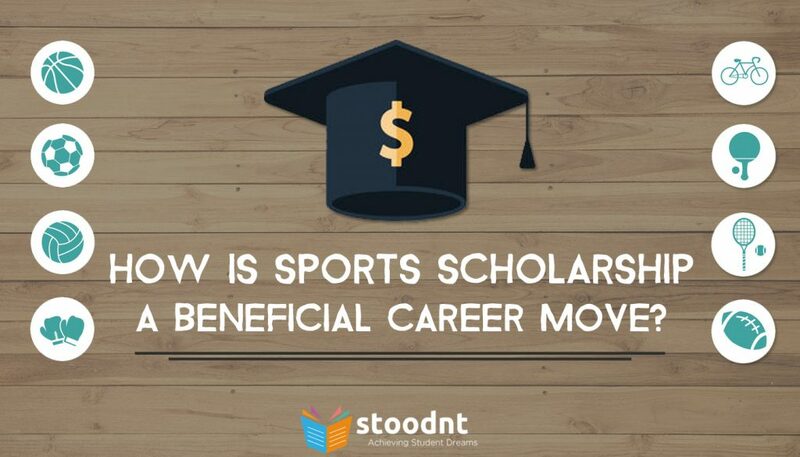 Additionally, focus on the reputation of the School, portfolio of the recruiters, and success record of the alumni. How is the career path after education to be a Chef? After your education, you need to work as an intern for apprenticeship. 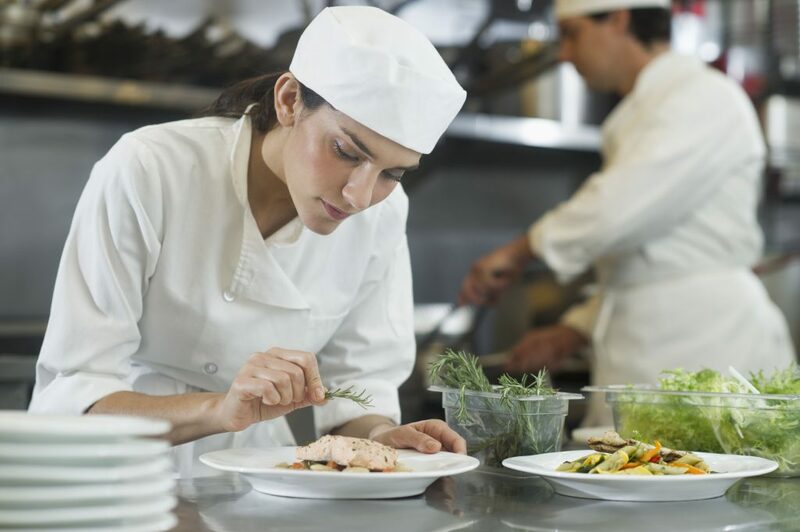 After joining the food & restaurant industry, you have to work your way up the career ladder – Commi Chefs (Commi 3, Commi 2, Commi 1) – also known as Assistant Chef or Cook. You will then move on to become a junior and then senior Chef de Partie. Then comes the position of the Sous Chef. A Sous Chef is the kitchen in-charge. The highest title one can get is that of Chief Chef, Executive Chef or Head Chef. It’s all about rising through the ranks. It is also possible to bypass the formal education part (if you have got really good skills and some kind of portfolio), and start your apprenticeship under a good chef. But, more often than not, a good chef always prefers a degree or diploma holder as an intern. How long does it take to become a Chef? It usually takes around 2 years to become a chef after apprenticeship (or training). It then takes another 4 – 5 years to become a Sous Chef. 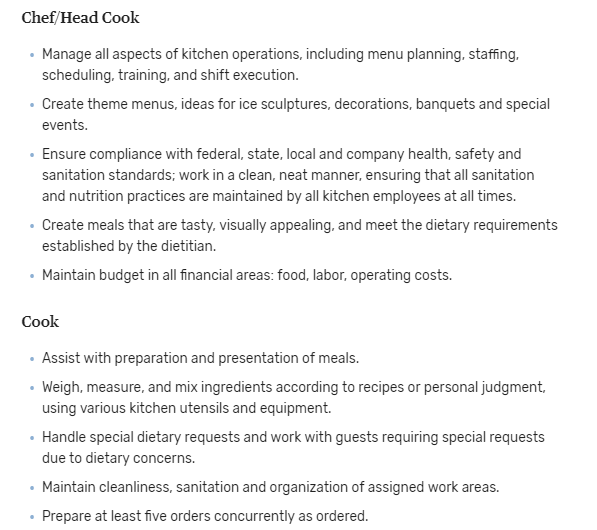 In about 10-12 years, a chef can reach the position of executive chef. An executive or head chef is kind of manager. As the executive chef, you will be responsible for all food and kitchen related decisions, including shopping list, deciding the menu, and innovating new recipes and dishes. At the starting phase, you can earn something between Rs. 7,000 to 10,000 per month as an intern. A Commis Chef earns something between Rs. 14,000 and Rs. 18,000 monthly (Glassdoor). If you end up at brands like Novotel or Marriot, you can expect Rs. 20,000 per month. 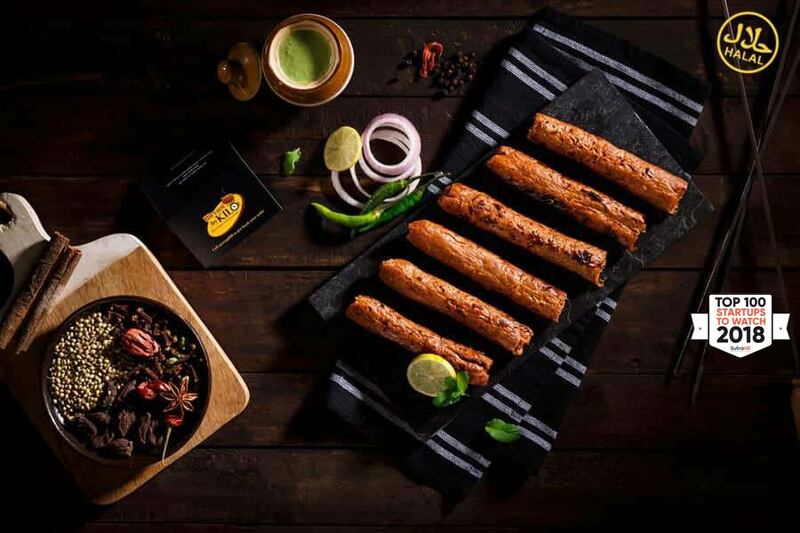 If you are innovative and competent at your job, you can expect to draw close to Rs 60,000 per month as Sous Chef – after 5 to 8 years post-training. 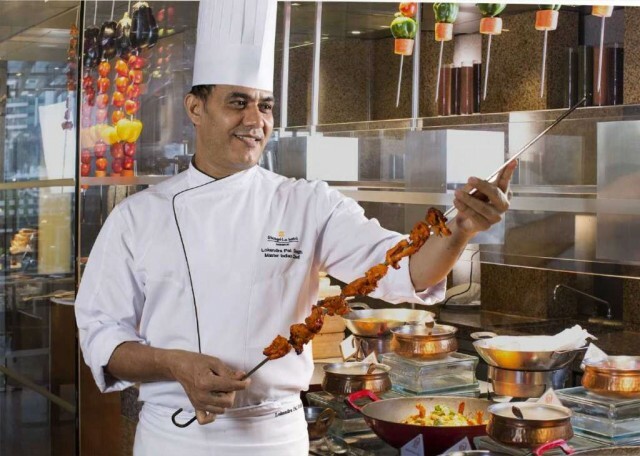 As an executive chef, you can earn Rs 70K to 1 Lac per month at reputed hotel properties or banquets. In addition to the salary, there are good opportunities for perks and incentives as well. After working a few years as Sous or Executive chef, you can also open up your restaurant or food joint. 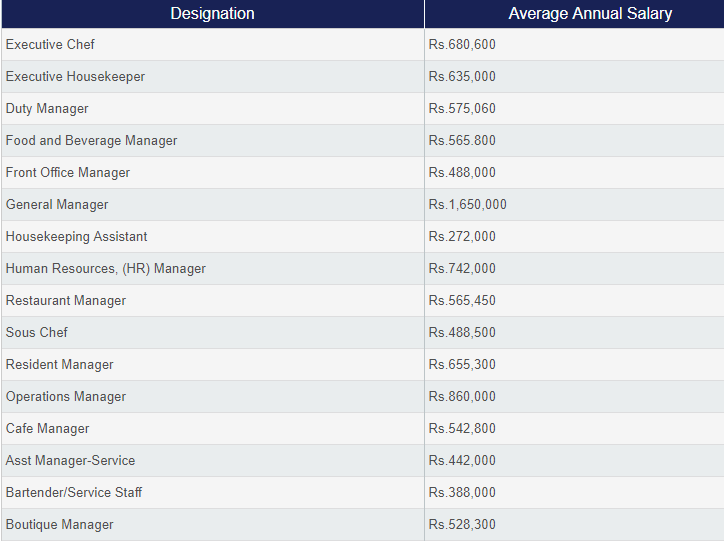 Outside India, the average salary is $24,000 per annum at the starting level. Within 4 – 6 years, you can earn something between $46,000 and $72,000 per year. The median hourly wage of a chef in the US is $10.44 (2013 data). 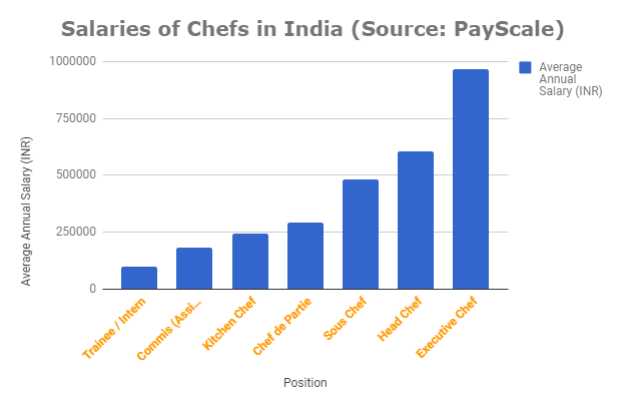 Below is the table of annual salaries of chefs in India as per PayScale. The job of a chef is very fast-paced and can be stressful. It also involves standing for long periods of time which can be physically grueling. Injuries are common and usually involve cuts, burns, slips, and falls. One of the most challenging natures of this career would be that you will be under more pressure during the festive seasons and holidays. You could rarely spend time with family and friends during the festivals. Besides, shifts are like 12 hours a day. So, you really need motivation, sincerity, and stamina to be successful in this career. 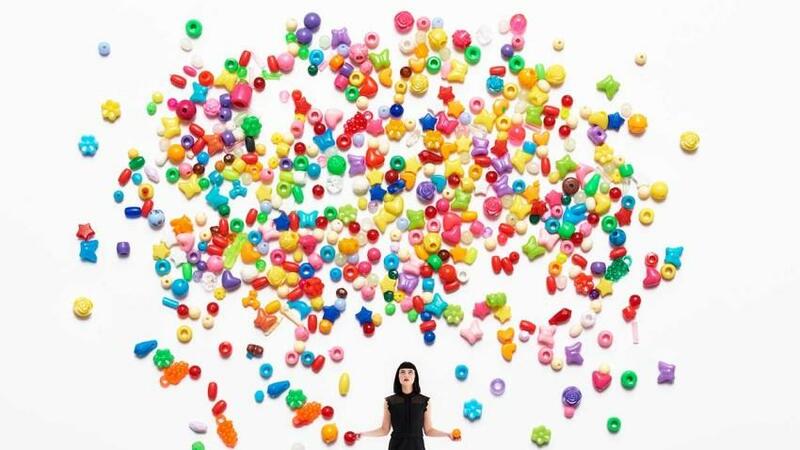 References: 1, 2, 3, 4, 5, 6, 7, 8.